When we got married (four years ago already! ), I (we) registered for all the fun kitchen gadgets and appliances that are absolutely necessary for cooking. I use a lot of dishes, plates, and utensils in the kitchen but don't always use the fancy electrics that we own. No more! I've pulled out the slow-cooker and decided to put it to work. My first thought about using the slow-cooker was that most recipes call for 6-8 hour cooking times. I'm often gone for 10-12 hours during the day, so this doesn't really work out very well. Then it dawned on me - I could cook while we sleep. I can prep the food after dinner and homework and then turn on the slow-cooker overnight. So I searched Epicurious for a slow-cooker brisket recipe and got to work! This recipe is definitely a keeper. There were a few things I didn't think about before cooking. 1 - All night we dreamed of brisket. The smell of roasting onions permeated the house. 2 - The slow cooker lid doesn't seal perfectly and we woke up to a stream of brisket sauce down the counter. Besides that - it was great! The recipe did involve a little prep work - not strictly a dump and cook recipe. First is browning the onions. Second is searing the brisket to get a nice brown crust. Then, cut potatoes into 1/4 inch slices and line the bottom of the slow-cooker. Next time I will halve the number of potatoes as they took up too much room. Then I followed the recipe and put the slow cooker to work while we slept. 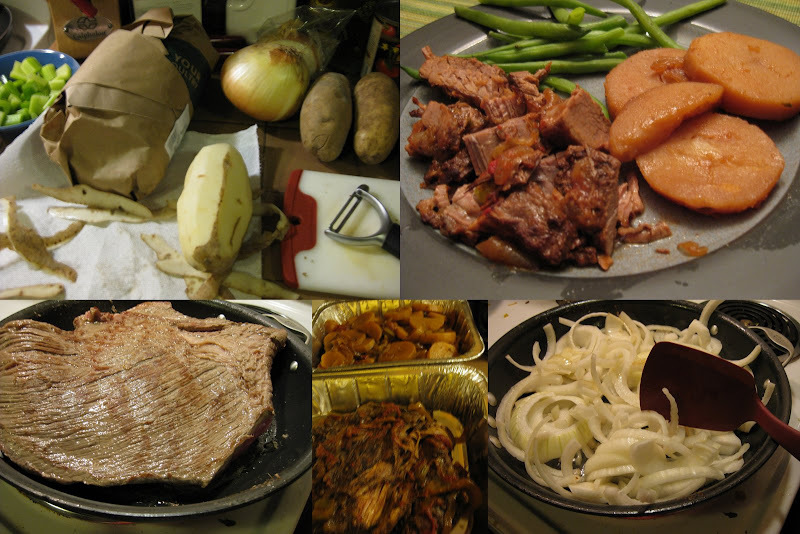 The brisket was fall apart tender, the potatoes had a great meaty flavor, and the veggies cooked down into a tasty sauce. For two of us we had enough for a few days of lunches and dinners. Stay tuned for more slow-cooker treats! I love the idea of letting the slow cooker do its thing while you're sleeping! Sometimes I want to make things in it, but they require so much prep beforehand that I would never have time to get everything in the slow cooker in the morning. This would solve my problem... except I could see myself eating brisket for breakfast! I love slow cookers! They make amazing meals. Unfortunately, I don't use mine anymore. I don't know why. I think I just forget about it. A tip I read recently is to use a lamp timer- assemble everything before going to work (or even the night before), and set it to start cooking at a certain time and it'll be done when you get home. Haven't tried it yet, but am very intrigued. Ashley - that's a clever idea. Might have to try that out! Thanks for sharing!